International supermodel and DKMS Ambassador, Coco Rocha, and DKMS Global Ambassador and Co-Founder, Katharina Harf, welcomed supporters to the Jimmy Choo store on Madison Avenue this week for an exclusive shopping event to benefit DKMS. DKMS is an international nonprofit dedicated to the fight against blood cancer. DKMS founder, Peter Harf, spoke about the importance of getting swabbed and potentially saving a life by becoming a bone marrow donor. “Coco and Jimmy Choo have both been incredible partners as we continue our work to support patients battling blood cancer and to motivate people to register as bone marrow donors. Our mission is as simple as it is life-changing. Everyone can get swabbed and therefore, everyone can become a lifesaving hero,” said Katharina Harf. 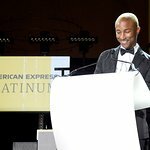 The evening also celebrated cancer survivor Anthony Daniels, who was diagnosed with blood cancer at just 19 years old during his sophomore year at Fordham University. Despite four relapses and 30 rounds of chemotherapy, Daniels never gave up trying to find a bone marrow match. While searching for a match, he teamed up with DKMS to help raise awareness about becoming a bone marrow donor. As a result, Daniels’ efforts and story helped register more than 4000 potential bone marrow donors and more than 50 cancer patients found their lifesaving donor matches. The event, held at Jimmy Choo’s Madison Avenue location offered guests and supporters the opportunity to discover the Jimmy Choo Autumn Winter 2016 Collection.